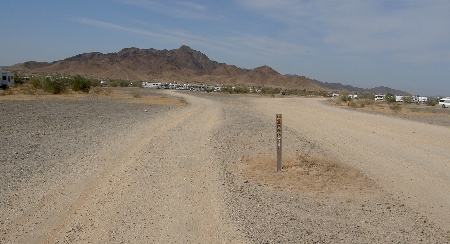 The RV Forum campsite is approximately 2.5 miles south of Quartzsite's four corners where I-10 and US-95 intersect. 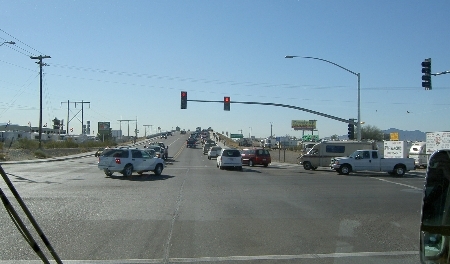 Business Loop I-10 is the Main Street of Quartzsite, Arizona and it is on the north side of I-10. US-95 is the road south to Yuma. The frontage road on the south side I-10 is Kuehn Street. From Main Street or Kuehn Street you want to go south on US-95. 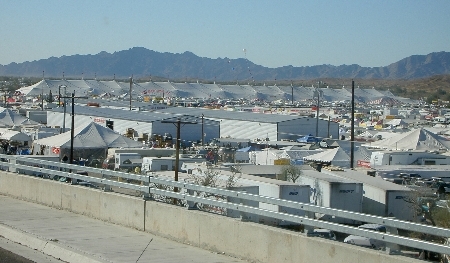 As you drive south looking from the top of the bridge crossing I-10 you will see on the left the Tyson Wells vendor stalls and on the right in the distance at about the 2 o'clock angle the large RV show tent (some years the tent is red and white but, in 2006, the tent was kahki or /gray in color). Our directions begin at the south side of I-10 at the intersection of US-95 and Kuehn Street. Our Quartzsite campsite is on the Bureau of Land Management Long Term Visitor's Area at Tyson's Wash, La Posa West section #541. The GPS coordinates are N33.38.054 and W114.13.591. Travel south on US-95 from the 4-way stop sign at Kuehn Street and US-95 (take a mileage mark here). 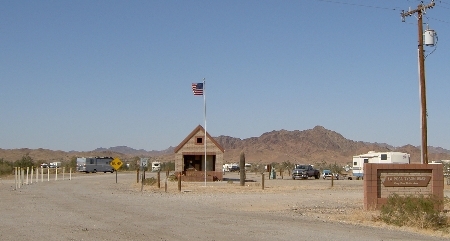 After approximately one mile you will see (and you will drive by) the first BLM entry and ranger station on the west side of US-95. 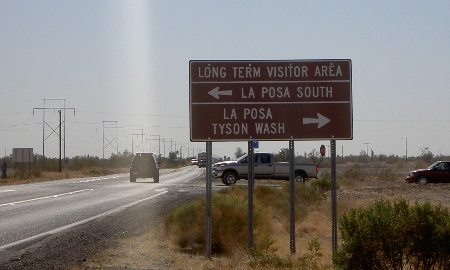 Continue south on US-95 for another 1.5 miles to the second BLM entry which is Tyson's Wash La Posa West. Just before reaching the turn into Tyson's Wash you will see mile post 102 and then a phone booth on the west side of US-95. At the right turn, you will see ranger stations on both the east and west sides of US-95. Turn right (west) off US-95 and go to the Ranger station to sign in and pay your fee. Immediately after the ranger station parking area, the dirt road curves right. Shortly after the curve (about 1,000 feet) you will come to a fork in the road with a yellow "dusty road" sign. At the sign, bear left (note, do not turn left, just bear a little left at the fork) keeping the brown 540 post on your left side and the yellow dusty road sign on your right.At this point you will be on a "main" road. After .3 mile you will see a 15 mph sign. Just after the 15 mph speed limit sign take the left fork off the main road at another brown post 541. Go straight for .5 mile and you should see tall flags flying from one or more of the RV Forum coaches. It is approximately .8 mile from the ranger station to our campsite. Click here for an arial view of the area, courtesy of forum member Richard Sharp, annotated with landmarks. If you use Delorme's Street Atlas you can download the route from the highway to the rally site in a Street Atlas draw layer file here courtesy of forum member George Mullen. Unsure how to use Draw Layer files? Click here for an explanation.